Welcome to the final bountiful week of winter! Beets— These beets are so healthy and beautiful, probably the best we’ve grown! Remember the tops are delicious, too. My favorite, favorite, FAVORITE way to treat beets is to make this beet hummus with lots of walnuts (I use double the recipe calls for), or this one with greek yogurt and pine nuts. Both are outstanding, even for folks who don’t really like beets. To save time, I will roast the beets on a day when I’m already using the oven, and store in the fridge till I’m ready to whip up the beet hummus. I serve it with a sprinkling of goat cheese and green onions with multigrain crackers, but pita bread or corn chips are really nice, too. Carrots—These carrots have done so well in our greenhouse, we’re planning on growing about 5x more next winter. This is what our deep greenhouse beds were made for! The tops are nutritious to add to a simmering pot of home made chicken stock. Collard— Large shares received this southern green. Use it as a kale substitute or braise it with bacon, onion, and garlic. Kale—Small shares received winterbor kale. Watch out for some aphids on the base of the leaves, and just rub them off with your thumb in a sink of cold water. We’ll be glad when the weather gets too hot for aphids! Mixed lettuce & Dandelion Greens—Fresh Salads are in your future! We had very little dandelion greens to give, so we combined them in with the still delicious as ever lettuce mix. Did you know dandelion is actually a medicinal herb, wonderful for supporting the liver? Spinach—This crop is nearing the end of it’s harvest life so it’s not as tender or abundant as it was earlier in the season. We’re thankful we still had a little to give to you. Sever roots from their tops to keep them from getting rubbery. Everything you’ve received this week wants to be stored cold in the fridge sealed up in a bag. Everything will need a gentle washing before cooking, but leave the dirt on until you’re ready to use them to prevent spoilage. 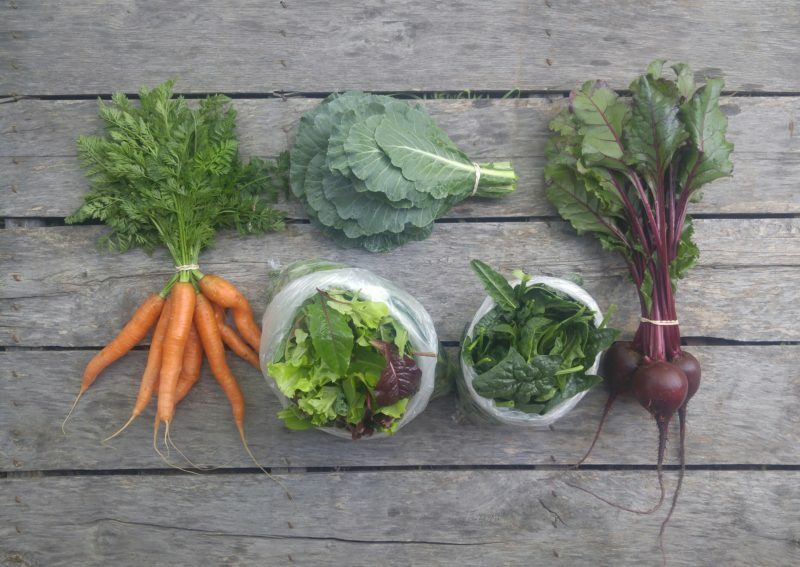 Large share from top left to right: Carrots, bunched collard greens, bagged lettuce, bagged spinach and beets. 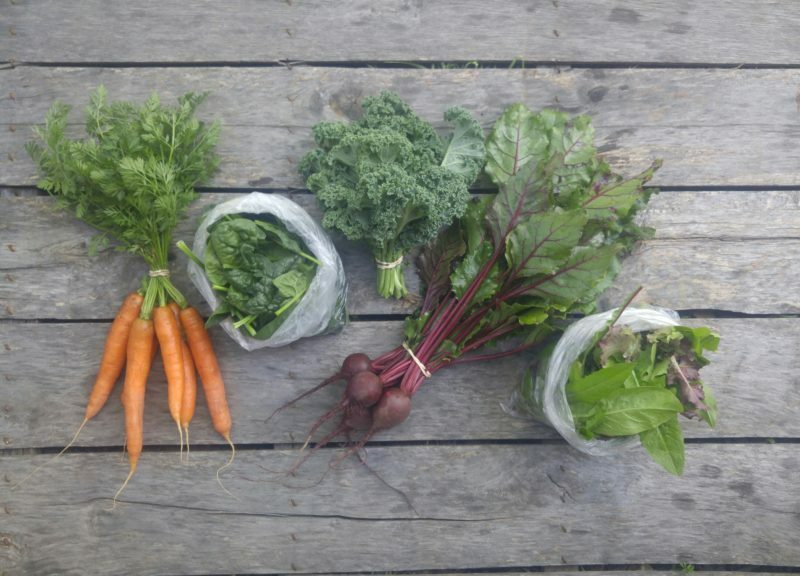 Small share from top left to right: Carrots, bagged spinach, bunched kale, beets, and bagged lettuce.